The heart is a muscle that functions as a double-sided pump and consists of four chambers. The two upper chambers are called the left and the right atria and the two lower chambers called the right and left ventricles. The right side of the heart pumps blood to the lungs to pick up oxygen, while the left side of the heart pumps blood rich in oxygen to all parts of the body. The left ventricle has to pump in a strong and effective manner to pump the blood to the farthest parts of the body. The pumping of the heart is regulated by electrical current that originates in the right atrium at the sinoatrial node and then travels to both the left atrium and the atrioventricular node which coordinates the pumping of the ventricles. This is called normal sinus rhythm. Atrial fibrillation (AF) is characterized by an irregular and rapid beating of the heart's atrial chambers and results when the normal electrical conduction system of the atria is not functioning properly. In atrial fibrillation, there is a storm of electrical activity across both atria causing them to fibrillate (quiver) 300-600 times per minute. Only a small number of these electrical impulses are picked up by the ventricles, but the ventricular rate can approach 180 or higher. Whether at high or low heart rates, the irregular rhythm renders the ventricle unable to pump efficiently. This leads to pooling of the blood within the heart and insufficient amounts of blood being supplied to the body. This can result in a variety of symptoms and problems. It has been estimated that atrial fibrillation occurs in about 4% of the general adult population and affects approximately 2.2 million people in the United States. About 160,000 new cases of atrial fibrillation are diagnosed each year. Atrial fibrillation occurs about 1.5 times more frequently in males than in females. It is estimated that atrial fibrillation is responsible for over 60,000 strokes each year in the United States. If you or a loved one has been diagnosed with atrial fibrillation, it's critical to learn everything you possibly can about this condition so that you can make informed decisions about your treatment. That's why we created the Medifocus Guidebook on Atrial Fibrillation, a comprehensive 199 page patient Guidebook that contains vital information about atrial fibrillation that you won't find anywhere in any other single source. The underlying causes of atrial fibrillation. The different types of atrial fibrillation that are recognized. A description of the American College of Cardiology/American Heart Association classification system of atrial fibrillation. How atrial fibrillation is diagnosed based on factors such as signs/symptoms, physical examination, and specific diagnostic studies that are used to confirm the presence of the condition. The medications that are commonly used to control the heart rate. The options that are available for controlling the heart rhythm by converting the patient from a state of atrial fibrillation back to normal sinus rhythm - a strategy known as cardioversion. Which patients with atrial fibrillation are candidates for implantation of a permanent pacemaker or an implantable cardioverter-defibrillator. The known risk factors that increase the likelihood of stroke in people with atrial fibrillation. The classification system, known as CHADS-2, that doctor's use to estimate the risk of stroke in people with atrial fibrillation. Medications, known as anticoagulants ("blood thinners") that are prescribed to reduce and prevent the risk of stroke in atrial fibrillation. The risks and benefits associated with anticoagulation therapy in people with atrial fibrillation. Newer anticoagulant medications that are currently in development that may prove to be safer as well as more effective for stroke prevention than currently available anticoagulants. A Guide to Recent Medical Literature on Atrial Fibrillation - This section of the Guidebook contains an extensive bibliography of over 100 references to recently published articles about Atrial Fibrillation in authoritative, peer-reviewed medical journals with links to the absracts (summaries) of the articles. These articles represent the latest advances in the field and focus on cutting-edge research, new developments, and the lessons learned from recently published clinical trials involving patients with Atrial Fibrillation. This is the same level of that is used by doctors who treat people with Atrial Fibrillation to keep abreast of the latest developments and breakthroughs in this specialized field of medicine. Centers of Research for Atrial Fibrillation - We've compiled a unique directory of doctors, hospitals, medical centers, and research institutions with special interest and, in many cases, clinical expertise in managing people with Atrial Fibrillation. The "Centers of Research" directory is a valuable resource for quickly identifying and locating leading medical authorities and medical institutions both within the United States and other countries who are considered to be at the forefront in clinical research and treatment of Atrial Fibrillation. You'd have to spend days - or even weeks - attempting to compile your own list of doctors and medical centers but, with the "Centers of Research" directory, the information is already right at your fingertips. All you have to do is act on the information by selecting and contacting the experts or medical institutions listed in the directory by state and country. Organizations and Support Groups for Atrial Fibrillation - The Guidebook also includes a directory of organizations and support groups whose goal is to help people with Atrial Fibrillation by providing access to information, resources, and services. Many of these organizations can answer your specific questions, enable you to "network" with other patients, and provide guidance in areas such as financial, social, or medical-legal issues. This valuable directory of organizations and support groups includes complete contact information, including phone numbers and E-mail addresses. 20% Discount - For a limited time, you can purchase the Medifocus Guidebook on Atrial Fibrillation at a special 20% discount off the regular list price. Your 20% discount will automatically be applied when you go to "Checkout". Order Your Copy of the Medifocus Guidebook on Atrial Fibrillation Today! The Medifocus Guidebook on Atrial Fibrillation is available in the following two convenient formats: Printed and Digital. "The MediFocus Guidebook on Atrial Fibrillation has enhanced and clearly explained this condition for me. It has also enabled me to make choices with confidence regarding my treatment. The references in the medical literature section has put me in touch with the research base in this country. Many thanks." 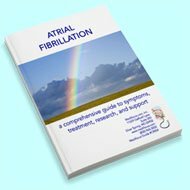 "I found the MediFocus Guidebook on Atrial Fibrillation extremely informative and very easy to understand. As a result of the information in the Guidebook, I'm able to discuss my problem with my doctor in a more informed manner and make better decisions regarding treatment." "The Medifocus Guidebook on Atrial Fibrillation gave me far more information than was available from my doctor and helped me understand my condition."